Slicey the Pig just realized how delicious he is and now he wants to share himself with you! 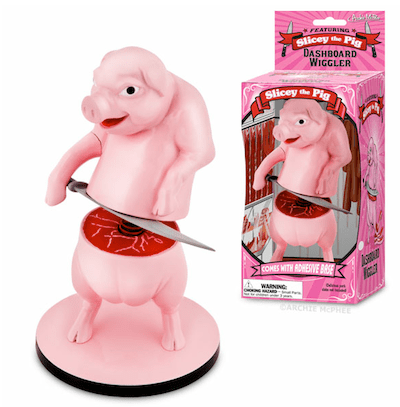 Taken from an old French advertisement, this vinyl pig holds a large carving knife to his own mid-section while he grins maniacally. Stick this 6-1/2" (16.5 cm) piggy on the dashboard of your car with the adhesive base and he will go into a slicing frenzy every time you go over a bump. That crazy Slicey, what will he do next?